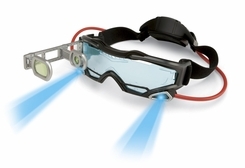 Spy Gear Night Goggles by Wild Planet let you know what's ahead of you in the darkest spots. The twin LED beams of light let you see up to 25' in the dark. These googles are impact resistant, lightweight and comfortable. Look extra-cool and stealth for secret missions. Take your sleuthing to the next level when you launch spy miissions under the cover of darkness. These night goggles will be your best spy partner during covert operations. Features two built-in super bright blue LED lights, Fold-out sighting scope with crosshairs, blue-tinted lenses for night vision. Requires 3"AAA" (LR03) batteries, not included.